A storage cart on wheels is a simple and convenient piece of furniture that is finding it’s way into more and more homes. It seems like almost anyone who lives in a house or an apartment, finds that they lack storage space for all of the items they need to put neatly away. A storage cart with wheels offers individuals and families a solution to their need for extra storage space, without paying an arm or a leg for a heavy bulky piece of furniture. Best of all, there is a storage cart on wheels designed for almost every room in the house, and every need you can think of. The Sterilite company is one of the largest manufacturers of plastic storage containers in the world. For over ½ a century, this company has been designing and manufacturing plastic storage containers that meet the needs of people in all types of situations and from all walks of life. The Sterilite 3-Drawer Wide Cart with wheels is just one of the many products they offer to help solve your storage problems. This Sterilite 3-drawer cart on wheels is the perfect size for use in a nursery, kitchen, closet, or a number of other places. The drawers look quite deep and seem to be ideal for storing tee shirts, dish towels, kitchen tools, and other fairly lightweight articles. This cart with wheels and drawers is the ideal height to use for storage in a closet or even at the foot of a bed. 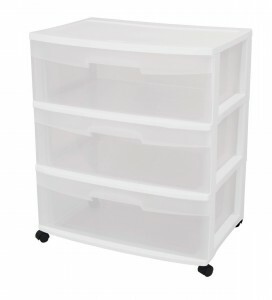 May also serve to put crafts or art supplies in, both at home or in a classroom. Reviews for this Sterilite cart on wheels are quite positive with cart receiving great feedback from customers. Most customers found this cart did help them keep various items neatly organized, and served as adequate storage to meet their needs. Customers did note that you can’t put anything on top of this cart as the plastic top sinks, making the first drawer difficult to open. However, you can easily solve this problem by getting a piece of wood cut to fit the top of cart. Overall, most customers found that this 3-drawer cart did what they expected it to do at a reasonable price. Whitmor Designs is a 4th generation family owned and operated business that is dedicated to manufacturing home organizational products for every room in the home. The Whitmor Supreme Cart on wheels with chrome steel construction is just one of the many solutions they offer to help families with their home storage needs. The Whitmor Supreme cart with wheels has many features that makes this cart a good choice for many different type of storage needs. Apart from the fact that the shelves are not angled, this set of shelves remind you of bakery shelves, with the exception that they are designed to hold far more weight than that tray of doughnuts. These shelves appear to be well made and designed to withstand years of use all for an extremely attractive price. Reviews for the Whitman supreme cart on wheels are excellent, with this cart receiving impressive feedback from various review sites. Most customers absolutely loved the price of this cart on wheels, feeling that they more than got their monies worth. Some customers felt that the wheels on the cart could be better quality, and several customers found that although they loved the cart, once it was put together, it was difficult fitting the shelves on correctly. Overall, the majority of customers felt that the Whitmor Supreme cart was an excellent product and a great buy. For over 30 years, Seville Classics have been providing organization and storage units. The Seville Classics Home Style Mobile Storage System is just one of the storage solutions that this company offers to home owners, renters, and families. 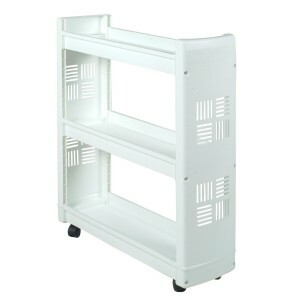 The Seville classics home style mobile storage system on wheels looks quite a bit like the Whitmor Supreme cart, and is ideal for those who want added shelf space in a single unit, as the Seville has 5 handy shelves. The Seville Classics Home Style Mobile Storage System with wheels is a very utilitarian looking shelf cart, that can hold a lot of weight and come in handy for a number of uses throughout the home. With 5 fairly large shelves, this cart is sure to help you organize that bathroom, closet or store room. Reviews for the Seville Classics Home Style Mobile storage system are quite impressive, with this cart scoring high with customers on various review sites across the internet. Overall, most people really found the Seville Classics home style mobile storage system functional and convenient for their specific needs. While some customers felt that this cart with wheels is somewhat pricey, most felt that they got exactly the quality that they paid for. 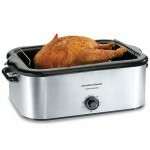 The Whirlpool company has a long history of manufacturing home appliances that fit the needs of the modern home, while still being simple and functional. The Whirlpool Laundry Supply Storage Cart with wheels is a small piece of furniture that Whirlpool offers, to help families keep their laundry room organized and all those laundry necessities close at hand. This is a great cart for use in a smaller laundry room to keep all those laundry supplies neat and tidy. It would also work well in a small bathroom to hold shampoos, cream rinses, liquid soaps and other items. Reviews for the Whirlpool Laundry supply storage cart are excellent, with this cart earning very positive feedback from customers. Not surprisingly, customers not only use this cart in the laundry room, but in bathrooms and kitchens as well. The only real complaint a few customers had was that they felt the cart was a bit pricey for being made from plastic. Overall, customers loved the Whirlpool cart on wheels and found it functional for a variety of uses. When most people think of Step 2, they think of a company that makes sturdy plastic indoor and outdoor toys for kids, and indeed many of their products are safe toys for children. However, when Step 2 began in 1999, their goal was to become an online site that supplied Moms and Dads with the products they need, both for their children and for themselves. The Garden Hopper Mobile Garden Stool And Storage chest on wheels, is a product that makes gardening easier, giving them a handy way to store those tools they need while gardening. The Step 2 Garden Hopper doesn’t just give you a great little tool case for those small gardening items, such as gloves, seeds, hand rakes, and garden shears, it also gives you a place to sit in relative comfort when planting or weeding the garden. Not only is the Garden Hopper Mobile Garden Stool And Storage a great asset to the garden, but it would serve just as well for your children to have a place to store those small yard toys as well. The molded plastic appears to be incredibly sturdy, and is the right height to be able to comfortably weed or plant in your garden, saving wear and tear on your knees and back. Reviews for the Step 2 Garden Hopper Mobile Garden Stool and Storage cart are quite positive, with this stool receiving great feedback from customers. Customers found this storage stool combo not only helpful in the garden, but in the house as well, for painting jobs and cleaning base boards in the home. There were a couple of things that some customers felt could be improved upon with the Garden Hopper. Overall, those people who liked working in their yard and garden found the Step 2 Garden Hopper with wheels convenient and comfortable to use. They felt it was an excellent product that made gardening easier and more convenient. The Winsome Wood Company has been making high quality wood housewares since 1977. The Winsome Drop Leaf Kitchen Cart With Wheels is a high quality attractive storage cart that can add both beauty and functionality to your home. The Winsome Kitchen cart on wheels is made from reclaimed cleaned and treated wood. This cart has many nice features that will make it a valued piece of furniture to have and to own. This is a beautiful wooden cart with wheels that is ideal for providing additional storage and food preparation space for those who have a small kitchen. Because this cart is on wheels, it will also come in handy for those outdoor cookouts on your deck or patio. The fact that this cart is made from reclaimed wood also makes it a great piece of furniture for those who are concerned with the environment. Reviews for this cart are pretty good, with the Winsome drop leaf kitchen cart with wheels earning excellent feedback in reviews across the internet. Customers found that this cart was not only handy for storing a number of kitchen items and preparing food, but also found they could use it as a small table (with stools), and for extra space to set serving bowls when having a family dinner. The one repeated complaint from many customers is that this cart can be somewhat difficult to put together. However, once the feat is accomplished, most customers stated that it was well worth the effort. Storage carts on wheels can be a quick and convenient solution to many families storage needs. The storage carts reviewed here cover a variety of carts for a variety of needs. Hopefully these reviews will help you to find the right type of storage cart to meet your specific needs.